It's a date that DDC, and many fans of the UND men's hockey team and the Minnesota Gophers, will never forget -- albeit for opposite reasons. Remember? Sorry. DDC just threw up in his mouth a little bit. Ok, he's better. It has been over two years since the Green and White and the Maroon and Gold have met on the ice, but for fans and players alike, that sure won't diminish the hostility as No. 3 UND and No. 13 Minnesota faceoff in a non-conference series from Mariucci Arena in Minneapolis Friday and Saturday. While the programs and fanbases sure know each other well, the two teams really do not. Just two players from the epic Frozen Four semifinal game in 2014 remain on UND's 2016-17 squad -- Seniors Gage Ausmus and Matt Hrynkiw -- and neither played in that matchup. 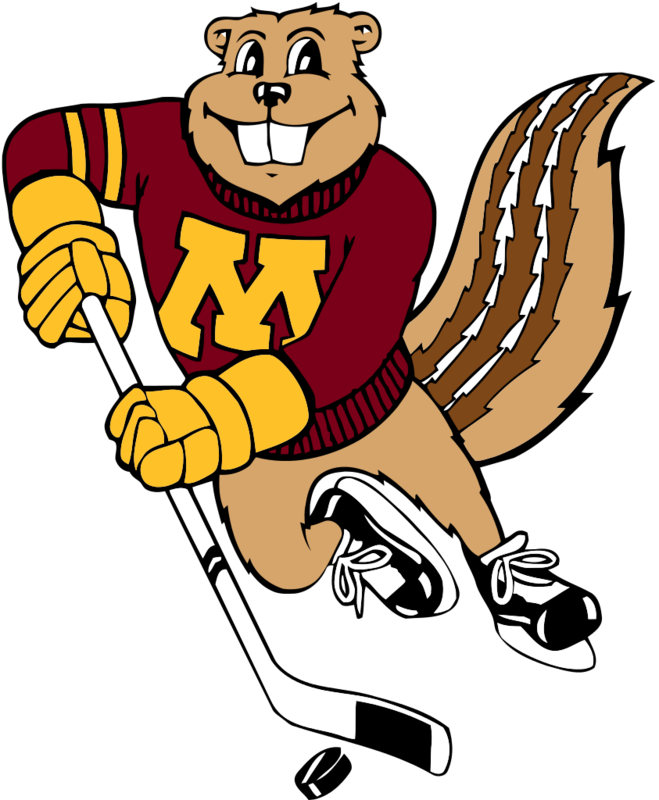 On the other side of the ice, just four on the Gophers were there -- Justin Kloos, Taylor Cammarata, Vinni Lettieri and Connor Reilly. None of those four registered a point or penalty. Unfamiliarity aside, there's no doubt this rivalry survives a couple years without playing. Make no mistake, these two teams want to win these games for multiple reasons, bragging rights included. "It's on our walls all over the rink, UND head coach Brad Berry said to the media on Wednesday. "We haven't played them in a few years, but the history and the tradition resonate through this building and out program." In a testament to that tradition, former Fighting Sioux greats and teammates T.J. Oshie and Taylor Chorney and current teammates of the Washington Capitals, drove six hours round trip to Grand Forks to speak to the Green and White about the importance of this rivalry during a day off in preparation for a game against the Winnipeg Jets. This week's Through These Doors also includes comments from Chorney and Oshie, talking about this UND program and touches on the rivalry renewed. While Minnesota's heart-wrenching goal was a true moment in this rivalry, UND has the chip that ultimately holds most importance -- the national title. For two programs that pride themselves on winning and tradition, this truly matters most. Sorry, Gopher fans. As we've said for the longest time and now have added to it, 8 > 5. Taking it one step further, 8 really is > than 0.6. Don't deny it. All rivalry gusto aside, these are two games that both of these squads want to win. UND got spanked last weekend in Duluth and needs to get back on track. Minnesota has started off the season well and wants a sweep against their bitter rival before they head into Big 10 play. As it always is, this weekend will be a fun one to watch. Here's what to watch for as The Rivalry renews in DDC's "Who? What? How?" series preview. So. F, Tyler Sheehy, 3 goals, 5 assists -- 8 points; Jr. F, Leon Bristedt, 3g, 4a -- 7 pts; Sr. D, Jake Bischoff, 2g, 4a -- 6 pts; Sr. F, Justin Kloos, 2g, 3a -- 5 pts; Jr. F, Mike Szmatula 3g, 3a -- 6 pts; So. G, Eric Schierhorn, 3-2-1, 2.78 goals against average, .890 save percentage. So. F, Brock Boeser, 6g (T-6th in NCAA), 6a -- 12 pts (T-5th in NCAA); So. F, Shane Gersich, 4g, 6a -- 10 pts; Fr. F, Tyson Jost -- 2g, 5a -- 7 pts; Jr. D, Tucker Poolman, 1g, 5a -- 6 pts; So. F, Joel Janatuinen, 3g, 2a -- 5 pts; Jr. F, Austin Poganski, 2g, 2a -- 4 pts; Jr. G, Cam Johnson, 5-2-0, 2.31 GAA, .894 SV PCT. The Gophers come into this weekend's series 12th in the NCAA in power play (20.8%) but are just 43rd in penalty kill (80.6%). Minnesota is No. 5 in the country in goals score per game with 4.17 and tied for 23rd in goals allowed at 2.83 goals per game. Gophers Head Coach Don Lucia is one win away from his 700th career win. He would become just the seventh coach in NCAA history to reach that mark. The Green and White have struggled on special teams this year, slotting themselves tied for 32nd on the penalty kill (83.3%) and 40th in power play (13.5%) in the NCAA. Despite giving up 63 shots on goal last weekend to Minnesota Duluth, UND still leads the NCAA in lowest shots on goal allowed with 21.71 shots per game and is eighth in putting shots on goal at 34.71. UND sits at 3.57 goals per game and 2.43 goals allowed, which puts them tied for 16th and tied for 19th respectively. No. 1 UND (5-2-0) got swept for just the third time in 88 regular-season series last weekend in Duluth. The Bulldogs swept the Green and White for the first time since 1995 and first time since 1992 in Duluth. No. 13 Minnesota (3-2-1) got a win and a tie in two overtime contests out east. The Gophers trailed Clarkson 3-0 on Friday night, but stormed back and won in OT 4-3. On Saturday, Mike Szmatula scored with just 23 seconds left to lead Minnesota to a 2-2 tie. of all time -- Matt Frattin's demolition of Kevin Wehrs in 2010. Boy, this one is hard. Everything in DDC's homer blood wants to pick a sweep, expecting the Green and White to roll into Mariucci with a chip on its shoulder and dominate Minnesota. However, UND is coming off a weekend in Duluth in which they were beaten handily and it looked like they weren't ready for a big stage. And simply put, this is a very, very big stage. DDC had a conversation on Thursday with his father, Papa DDC, and the thought came up -- "Which team in Green and White will show up in Minneapolis?" Is it the team that played tenacious defense and held its opponents to very few shots and only a few Grade A chances per game in a 5-0 start or the team that got wholly blown out of AmsOil Arena and showed its youth in front of a hostile crowd last weekend in Duluth? Much like UND, Minnesota has game-breaking skill in players like Justin Kloos and Tyler Sheehy. Also like UND, the Gophers seem to be a little leaky on the blue line and prefer to play an up-tempo game that features their skill and speed while doing their best to not let their opponent grind out games. One difference hasn't been expressed, thus far and that's the Olympic-sized ice sheet in Mariucci Arena. Minnesota has always been terrific using this extra space on the power play and they are going pretty strong with the extra man, so far. Slowing Minnesota's chances with the extra man, being responsible in the zone and clearing rebounds, will go a long way for UND taking points in Minneapolis. So, what's the game breaker this weekend? 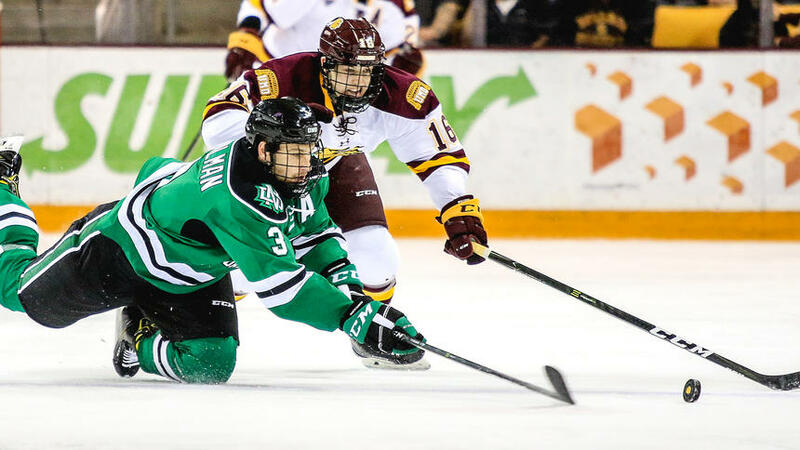 Minnesota isn't as solid defensively as Minnesota Duluth was last weekend and the Green and White must take advantage of this. Brock Boeser was held without a point last weekend and with the extra space on the Olympic ice and playing against a defense who isn't as strong, Boeser needs to produce. This extends to the blue line, as well. DDC foresees Tucker Poolman and Christian Wolanin, UND's best two playmaking defenseman, having opportunities to make plays. If big-bodied players like Rhett Gardner and Austin Poganski can take away the eyes of Minnesota's solid netminder, Eric Shierhorn, Poolman and Wolanin can go to work. While these two teams don't know each other very well, the programs do. UND and Minnesota are very aware of what this series means to their fanbases and this will be a fun series to watch. DDC was in the house for UND's destruction of Minnesota in a 5-3, 7-3 sweep in 2007 featuring one of DDC's favorite all-time plays in "The Rivalry" -- Robbie Bina's full-length goal. Just for funsies, let's see that one again. Sorry, not sorry. DDC had to. This was the last time UND swept Minnesota in Mariucci Arena. Again, everything in DDC's homer body wants to pick a sweep, but it's just too hard to do with last week looming over UND's head. However, with this adversity, you can take a bit of the homer out of the DDC, but you certainly cannot take all of it. The Green and White, after learning how to play in big stage last week in Duluth, doesn't lose in Mariucci, this weekend. DDC will be in the house on Friday, so he goes with a win there. There it is. It's exciting to this blogger that The Rivalry is back starting this weekend for the next seven year. This is a series that college hockey world needs to see every year and DDC is pumped that it's back. Check back later to see how it all went down. Just because he can, here's some of DDC's favorite moments from the best rivalry in college hockey. Hopefully this gets you all in the mood for some great hockey. Labels: 0.6, Brock Boeser, Eric Shierhorn, Justin Kloos, Kevin Wehrs, Matt Frattin, Minnesota, Robbie Bina, UND men's hockey, Who? What? How? Roses and Thorns: Let's Keep This Short, Shall We? For sanity's sake, we're going to keep this short and to the point. In a showdown of No. 1 vs. No. 2 in the NCAA, No. 2 flat out put it on No. 1. The UND men's hockey team traveled to Duluth and AmsOil Arena to take on the Minnesota Duluth Bulldogs, in a city where they hadn't been swept since 1992. Two losses later, 5-2 on Friday and 3-0 on Saturday, the Green and White left Duluth with their first two losses on the season. With the Presidential Election now just a week away, let's put this in prespective. The last time UMD swept UND in Duluth, George H.W. Bush was the current president and Bill Clinton had just been elected as the next. It was hard for DDC to find things he would consider Roses and Thorns were a plenty. So, DDC is going to keep it short. Flat out, UMD took it to the Green and White this weekend. Yes, UND gave up the first goal for the sixth-straight game, but it came after a very solid start for the Green and White. UMD did not register a shot on UND goaltender Cam Johnson until 13 minutes into the game and had just three in the first 25. However, the Bulldogs scored 11:24 into the second period on a shorthanded goal, added a power play tally just over four minutes later and rounded out the third with another shorty, with under a minute left, in the second stanza to pace a 3-0 victory. A promising start didn't lead UND to victory, but showing some early spark is the only real bright spot for the Green and White on the weekend. UND went a paltry 1-for-13 with the extra man against the Bulldogs, including a 0-for-7 mark on Saturday that included two minute-plus long 5-on-3 power plays. To make things worse, UMD netted two shorthanded goals on Saturday. Through seven games, the Green and White are just 5-for-37 (13.5%) on the power play and are 30-for-36 (83.3%) on the penalty kill, ranking them 40th and T-32 in the NCAA, respectively. Yuck. Simply put, this has to improve. UND came to play on Saturday after a wholly disappointing performance on Friday, but lost the special teams battle and that lead to the sweep. Time for the Green and White to become special on special teams if they want to get the results they are looking for. hat trick on Friday night. Last year's national championship team certainly had its share of young players, but also carried a core of upperclassmen, like Drake Caggiula, Paul LaDue, Troy Stecher and others that really knew how to handle big-time situations. In Duluth this past weekend, UMD showed that kind of veteran presence and handled the big stage much better than UND. The Bulldogs got five of their eight goals in the series from upperclassmen, including a hat trick from junior Alex Iaffalo on Friday. Yes, UND's best player, Brock Boeser, is a sophomore and to attest to the looking young point, Boeser was held without a point in the series. As the season goes along, the freshmen and sophomores will continue to improve, but to go to the next level, the Green and White needs to lean on their upperclassmen who have been there before, particularly on the blue line. Well, there you have it. Not much good came out of this weekend, but maybe this weekend's rough performance will lead UND to bigger and better things. For just the third time in 88 series, the Green and White were swept. That's a pretty remarkable run. Can the Green and White shake off this performance? Well, we'll find out and it's coming at an interesting time as UND travels to Minneapolis this coming Friday and Saturday to take on their bitter rival Minnesota Gophers in a regular season series for the first time since UND left for the NCHC and the Gophers to the Big 10. Yes, DDC fans, it's UND/Minnesota week. It's time to turn the page. Bring on the Gophers. Check back later this week for the breakdown of the best rivalry in college hockey back at it from Mariucci Arena. Thanks for reading.